The Aldabaan family were given passage to the US as refugees to start their lives over, having lost everything they had and knew when they fled for their lives confronted by war. Please take a breath and watch the video just above. It shows the total ruin of their home. The images were captured by neighbors three years after the Aldabaan family left -- taking only what was on their backs -- in the dark of the night. You can hear a neighbor identify the home as that of the parents of the oldest son Naji. The room with blue colored walls was their living room. What little remains of the kitchen shelving can be seen. Two bombs destroyed the structure and their belongings were looted. The meaningless key to the front door of their home is preserved as if an opening to a way forward. 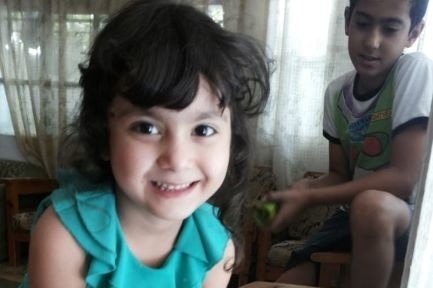 The Aldabaan family suffered unspeakable harms in Syria and later in a refugee camp in Jordan. Their transition to the US has included death threats and uncertainty. More details will be told in updates. The family are our neighbors in West Hartford, and they desperately dream to contribute to their community while providing for their own needs. They prepare exquisite Syrian food, and they have obtained licenses to serve it here. They yearn to purchase a food truck so they can realize this dream. They have always had a passion for and genius in the food industry, and were a part of this creative industry in Syria. The Aldabaan family demonstrates extraordinary grace in their continuing crisis. At present, their high school-aged son Naji has been working himself in the food industry, working afternoons, late nights, and weekends, borrowing time from his studies to help his parents make ends meet. His minimum wage income and that of his father are insufficient to meet daily expenses let alone open the doors to an enterprise that will advance their lives. Naji's next youngest sister, Amal, is currently looking for a job as a dishwasher in order to help her family pay for heat and electricity, which they currently cannot afford. Yet, they want a real chance. Articles have celebrated their perseverance and have given the appearance that they have arrived into a measure of safety and security. But, while it can appear that they landed, they struggle daily. It is impossible for them to continue in their present state. They are immensely grateful for all they receive. Please know that you will enjoy the finest meal as a sign of their gratitude. The food truck we are asking your help to purchase is the investment that will change their lives. It will give them the means to generate income from their business in earnest. Rahaf and Naji in Jordan where they refugees when they fled Syria. 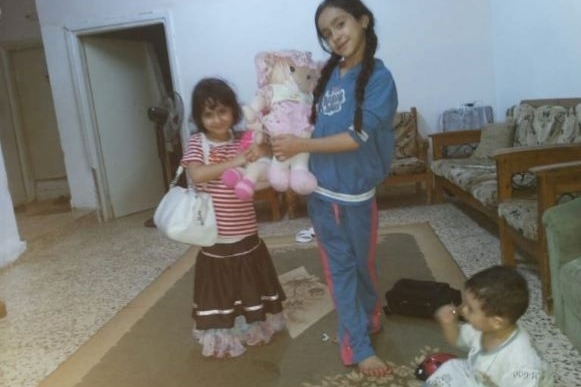 Rahaf, Hala, and Ahmed in Jordan receiving toys and hand-me-downs from a good samaritan.